The Pittsburgh Steelers lost to the New England Patriots and possibly home field advantage in the NFL Playoffs. 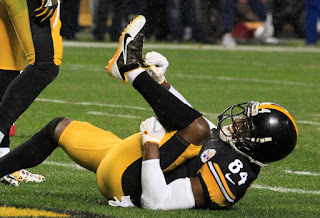 However, they also lost WR Antonio Brown to a partially torn calf muscle. If your fantasy football team somehow still managed to win and reach the fantasy football championship, you have a huge hole to fill. Most of you will have a player on your bench that you are comfortable starting. However, if you need to add one, below are the 10 WRs that are less than 60% owned on Yahoo and have a WOPR greater than 20% (min 20 targets), weeks 11-15. WOPR stands for Weighted Opportunity Rating. 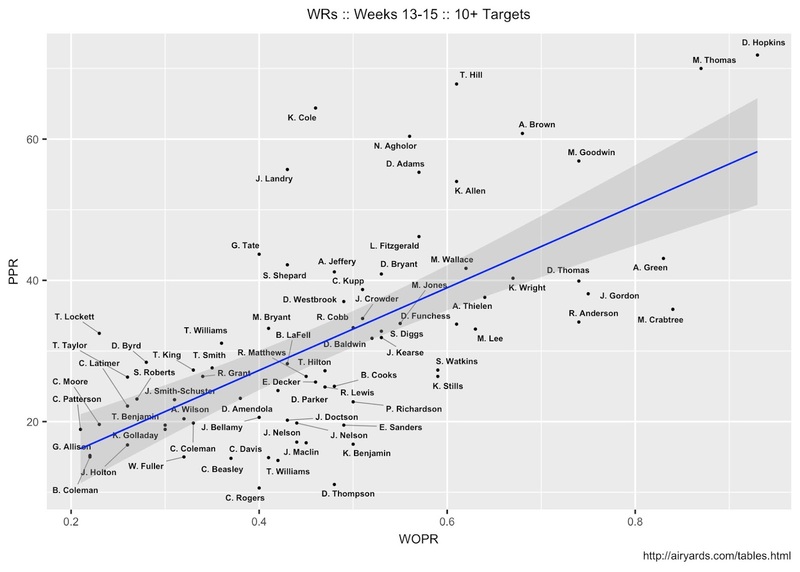 WOPR is a weighted combination of the share of team targets a player receives and the share of team air yards. The Jacksonville Jaguars have clinched a playoff birth despite losing WRs Allen Robinson and Allen Hurns. Marqise Lee has done his best to be Blake Bortles WR1, but in recent weeks, Dede Westbrook has been the most targeted Jaguars receiver. However, Keelan Cole has proven to be a weapon for Bortles. With a touchdown in three straight games, Cole has racked up 334 receiving yards.